"We don't want comparisons", said the Formula E series CEO Alejandro Agag recently of those that might be made between his own category and its formidable old motorsport relative of F1. And he has good reasons to think that way. Comparisons between motorsport forms aren't always helpful, at the very least they need to be applied with caution. Different categories have their different place in the landscape, and something that works for one may not be sensibly transported into another. By Avda - Own work, CC BY-SA 3.0, https://commons. Take BTCC for example. It's popular and exciting, but much of its excitement is linked to rather interventionist measures like success ballast and often rather Destruction Derby-type racing. Whatever F1's problems few think it should be doing something similar, it's simply not in its DNA. Even at the other end of the scale for all of WEC's success and growth importing things wholesale into F1 wouldn't necessarily be helpful, as was explained in this excellent article by Edd Straw. In other words, all motorsport forms have a right to exist in their own terms, at least to some extent. But it doesn't stop us trying to make comparisons, particularly with F1 which all psychological roads in motorsport seem to lead to. 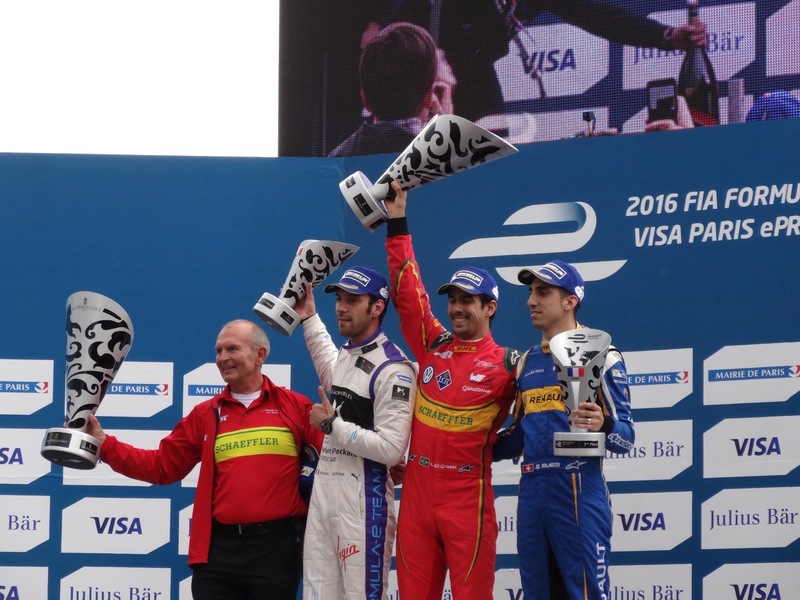 As these Formula E highlights show there has been plenty of drama and associated stories in FE's almost-two seasons of existence. The on-track racing has been good, and this campaign shed a lot of the amateur hour and repeated crashing that some accused it of in its opening season in 2014-15. Its driver line-up is a strong one also, aided by F1's tendency to discard or even not let in in the first place rather worthy pilots. Yes I'm looking at you Helmut (though Dr Marko in fairness is far from the only one). While that FE - now around two-thirds through its second campaign - is still going perhaps is the greatest achievement of all. And that's not something said to be flippant, given the cynicism that was around when the series launched; given too that it sailed close to the financial wind for a while in its freshman season. 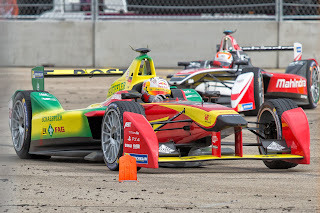 As has been pointed out, whatever Formula E's challenges that lie ahead they likely are not as difficult to surmount as this one surmounted already. Technology obviously is somewhere near the Formula E core - the clue is in the name, that it's a testbed for electric vehicle technology. But this also in at least a couple of ways is a doubled-edged sword possibly. The importance of electric technology has grown in recent times, though the current consensus is that electric power remains a medium term rather than long term solution in the automotive world. Indeed at the extreme end of this scale there even have been reports of the US Navy developing fuel from seawater. The risks of FE finding itself in time backing the wrong horse as it were are clear. Unlike F1 it's tied to a particular type of technology, short of a rebrand at least (I recall discussions of the Australian V8s perhaps renaming their series on similar grounds...). Such things can develop in unforeseen ways however, and Formula E will be hoping that it does similar as F1 did with energy recovery, which the car industry was close to giving up on before F1 got its fearsome engineering teeth into it. That old one about motorsport improving the breed. 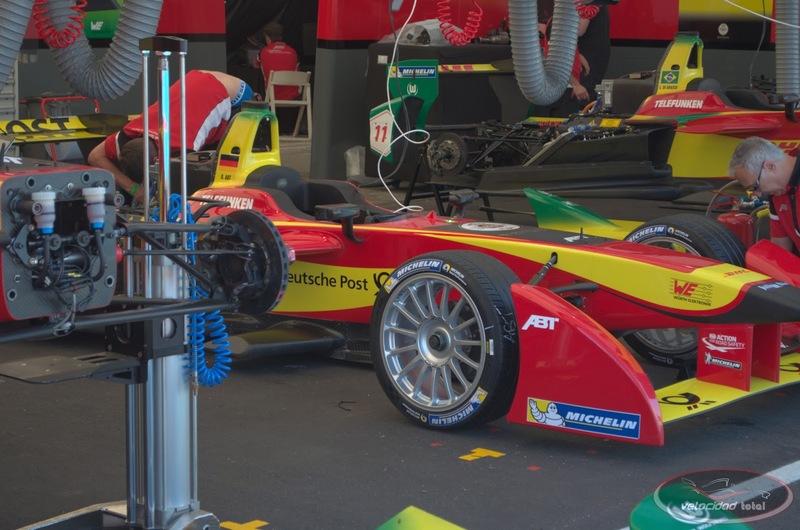 Furthermore FE started as a single-make series last year and a careful plan is in place to open up variation and innovation over time, such as this year development around the e-motor, inverter and gearboxes permitted. This constraint and caution has caused some frustration but it also is sensible, as the series is wisely wary of creating a technological arms race which in turn will likely make the whole thing unsustainable. Again look around motorsport history and stumbles and falls are much more associated with over-reaching than with timidity. As Agag admits indeed, "we have to compromise between the dream and reality". In the meantime though Formula E doesn't hold much at all to F1 on technology, and this is reflected in the FE car's top speed of around 135mph, well short of what an F1 car can reach. Indeed, in a flipside to the kudos of bagging a race at iconic Monaco last season, the Formula E cars looked visibly slow around the Principality compared with what we'd grown to associate an F1 car doing there. Yet, in another flipside, while the annual budget for a back of F1 field straggler team is at least $44m, in Formula E it is capped at $3.5m. It's not just a reflection of F1's bloated budgets either, as an Formula E annual budget is only about a quarter of that in WRC or DTM as well. And yes, I did say 'capped'. FE has a cost cap, something F1 has been wrestling with for years - identified as a solution to its determination to spend itself out of existence but constantly rejected as unworkable (or, if you are to be more cynical, as against the interests of certain major players). Of course a series that starts from scratch and that remains close to a spec formula, as FE is, has a massive advantage in setting and then enforcing such a cap, and it'll be interesting to see how it withstands the greater technical freedom that awaits in future FE years. F1 should watch with interest. As I said though comparisons aren't always that valid. But not just because of F1 behing 'ahead' as it were. 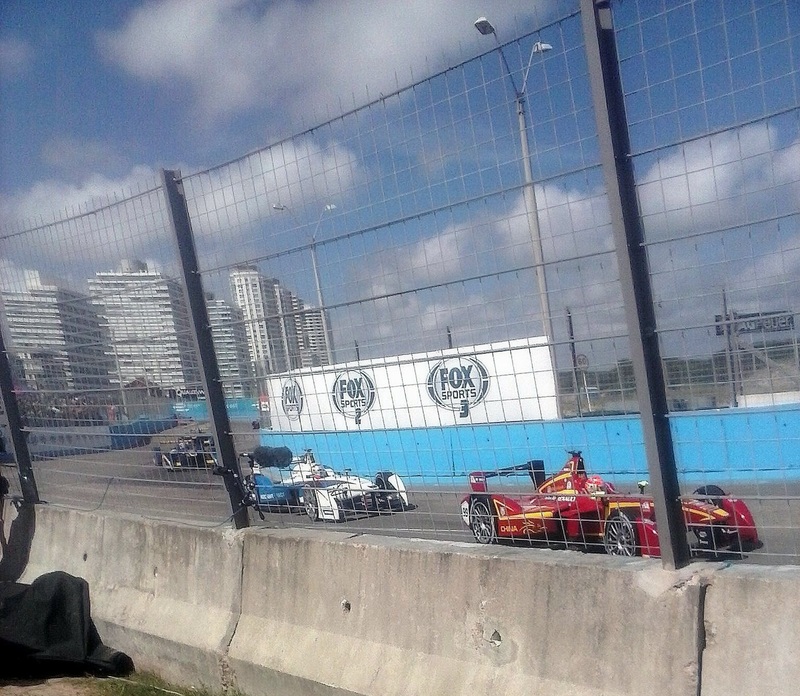 There are a few things that Formula E is doing that outstrip F1, and by a distance. By Liondartois - Own work, CC BY-SA 4.0, https://commons. Take the previous FE race for example, in the middle of one of the world's most iconic cities in Paris, and moreover with a track at the famous Les Invalides. Autosport's Formula E correspondent Scott Mitchell, perhaps not with all that much hyperbole, suggested even that it might be "modern motorsport's greatest achievement". Whatever else it was, it represented a massive first adult stride for the series. Such a concept for F1 would be a non-starter, or perhaps even more remote than that - a combination of the more powerful cars requiring more space for run-off and the like, the greater disruption including that it's a longer event (FE squeezes its entire meeting into a single day), and not least the noise as opposed to the nearly silent electric power. Indeed for all that F1 agonises about the quieter-than-before hybrids there are potential upsides, which it hasn't quite yet twigged on the whole. 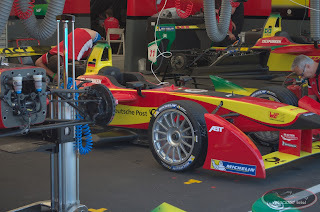 No doubt FE's much healthier image, a new series promoting green technology as opposed to F1 which usually does its best to make itself look undesirable to outsiders, is part of it too. Those involved reckon that had they not been electric they would not have even got an initial meeting with Parisian decision makers. "We were able to justify it because the message is fundamentally different," said FIA president Jean Todt. It's not isolated either. FE has a London race already after F1 had speculated about one for decades. FE is at Long Beach, one of F1's most missed and preposterously-abandoned venues. Another underpinning of FE is to take motorsport to the people, rather than the old way of expecting people to decamp to wherever the motorsport is. As intimated the series is based around the downtown street track, and as Jack Nicholls - a man who has commentated on both series - noted "to go to an F1 race you have to make a pilgrimage, you have to drive or get the bus or train 60 miles out of a capital city. 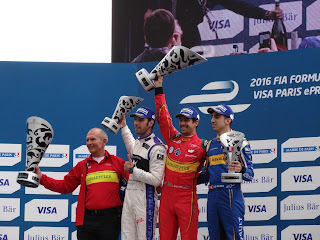 It's amazing to be in the city centre with Formula E". F1 wants to do city centre locations, but tends to stumble across the impediments already outlined. Sebastien Buemi explained too that FE's taking motorsport to the people also is not merely about location: "it's easy to access the pit lane, the paddock and to nearly touch the cars" he said, again showing a stark contrast with F1. There have been teething problems for FE, such as complaints about fan access to the site, stewarding and available vantage points at the recent Paris event mentioned, but hopefully they are but teething problems. But even so fan access isn't where FE has its most instructive lesson to F1. As the estimable F1 journalist Dieter Rencken pointed out recently after a visit to the Geneva International Motor Show, motor manufacturers are displaying their FE connections - in terms of machines on display and the like - much more noticeably than they are with F1. Renault, DS, Audi, VW, NEXTEV, Mahindra and Jaguar all take part in FE, perhaps BMW and Nissan will join next season too. It already is massively outstripping F1 in terms of the number of automotive brands involved. Partly it's down to cost as mentioned; partly it's the desire for the green glow of the series to reflect on them. Partly as Agag outlines it's a matter of having a clearing in the landscape all to yourself. "We're the only ones in the space" he said, "so for anybody doing electric cars there's nowhere to go. They have to come here...". Yet in the meantime F1 wonders about its lack of manufacturer involvement as well as its lack of other investment. Why it finds itself instead reliant on inflated hosting fees from (often questionable) governing regimes far from its core audience, as well as the buck from TV which has the knock-on impact of putting coverage behind paywalls increasingly. Most of the above about FE's attractions to investors, flipped to be viewed from the other end of the telescope, makes up the explanation. F1 not only has rather a negative, perhaps amoral image, also it has even found it hard to love its own new 'green' technology. Sometimes it does its best to give the outward impression that it's all been an unmitigated disaster (talking to you Bernie, Seb and a few others). But FE shows the rewards from embracing it. By IgnacioR96 - Own work, CC BY-SA 4.0, https://commons. 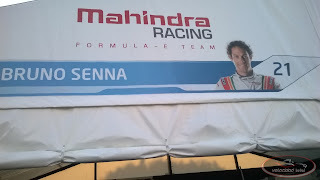 Attracting young people is another factor fairly central to Formula E's aims, attending an FE race event and seeing the DJs (or rather, EJs - geddit?) and the like make this clear. It helps too that ticket prices are much lower in FE than in F1. As does the series' full embrace of online coverage and interaction. This most notoriously is manifested in FE's fan power, where in an online vote fans use social media hashtags to decide who should get a 100kJ power boost in the race. It's well-intentioned of course as something for the X Factor age, and in FE it works as a bit of fun as well as to attract some interest. It's a bit too Wacky Races for F1 (plus there's a risk Rio Haryanto would win it every time), but still there's a broad learning point for F1 there, around online and social media promotion and interaction. Here Formula E is really showing the way to its grand old relative, and only now is F1 beginning to pace cautiously into that area. "They are using television and social media very very well, their promotion is very good...There are lessons that can be learned from that for Formula One" concluded Saward. While Nicholls added that all-in "the result is you get a varied audience, some people who clearly know what's going on and love it and some people who are new to motorsport". And here perhaps is the biggest learning point. That any rising tide of motorsport interest will raise even the grand liner of F1 too. As Saward outlined, "we should applaud that, because these are the kind of people that might say 'this Formula E's alright, what's that noisy stuff, I wonder if that's any good...'"